The Lightning family of microwave and millimeter-wave vector network analyzers encompasses a wide range of high performance, component test tools designed to address the growing needs of defense, satellite, radar, broadband communication, and optoelectronic component markets. The Lightning family features the latest in technology and performance. Specific models and added options offer higher levels of measurement capability, including Time Domain, Gain Compression, Harmonic, IMD, Frequency Translation, Multiport, and E/O and O/E measurements, in addition to fast and accurate S-parameter measurements. The Economy Lightning models are basic two-port VNAs designed for passive applications. They are available in four different frequency ranges, namely 20 GHz (37247D), 40 GHz (37269D), 50 GHz (37277D) and 65 GHz (37297D). 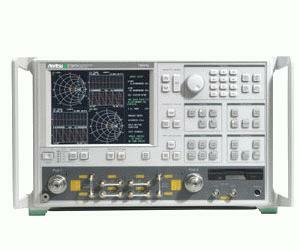 Each model can be configured as an economy millimeter-wave VNA by simply adding a millimeter-wave test set, two synthesizers and the desired mmW modules. They differ from the Premium series in their ALC range, power handling capability, and do not include internal bias tees or the gain compression application.